A fellow whiskey enthusiast and a reader of this blog (aka a “WhiskeyBender”) sent the following amazing specimen of a pre-prohibition bottle of Golden Wedding Whiskey. For those of you who remember my Dad’s Golden Wedding post, this is quite the polar opposite of those examples. Distilled by Jos. S. Finch & Co. of Pittsburgh, PA, this beauty has held up well over the years and looks like it would be Mmmm mmm good. You don’t see old stuff out of Pennsylvania that isn’t Rye very often. This bottle comes to us from Slovenia. How it got there, I have no idea. The owner plans to open it upon the receipt of “first great news.” I would say getting up in the morning would work for me! Send samples, please. Here is the reverse. Cheers! O…M…G… That is spectacular! 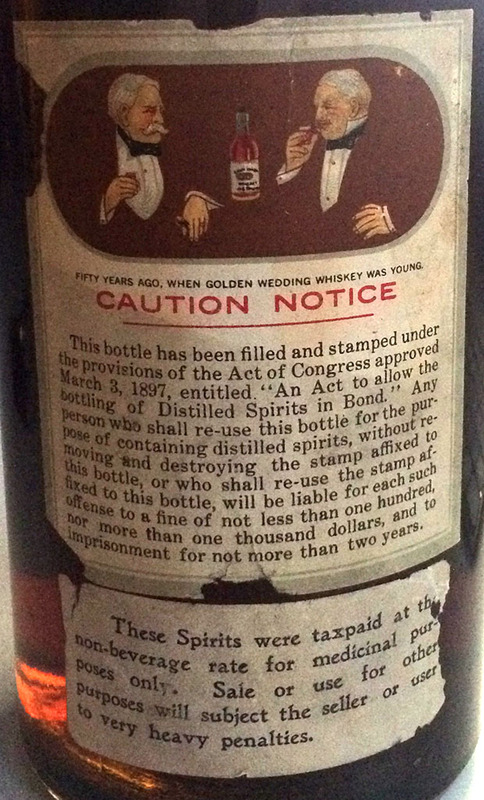 The “Barreled in 1898” label looks like a strip added later. I wonder if it’s real? The bottle itself clearly is. It looks amazing. What a find! Good observation! I wonder where the proof statement is. Maybe it got torn off with part of the missing label. But when was it bottled? What is it with that remark of “50 years ago when GWw was young”. Although it is missing the tax stamp we know from the back of the label that this was Bottled in Bond, which means it is at least 4 years old. We can also reasonably assume that it was bottled before prohibition. That narrows the bottling year from 1902 to 1919. Not that helpful. My best guess is the stuff was bottled before 1910 because it looks older than a 4 year old and pre-pros weren’t overaged like the medicinal whiskey stocks. Pa.. He sells Golden Wedding Whiskey. (U D Archive, Uncataloged Manuscript).” In 1898 this would put the brand at 50 plus years old making the tag line make sense from a marketing point of view.